You are here:Home Articles Can anyone learn to sing? Can anyone learn to sing? Or do you have to be born with the singing gene? In my opinion and experience, the answer would probably be yes, anyone can learn to sing! Most people are born with vocal cords and are able to make sound with them. So if you can make sound, then you can sing. Right? Well, maybe. If you were truly tone deaf, then the chances are you probably can’t sing. Being tone deaf is the inability to hear the difference between two pitches, so how would you know how to sing if you can’t hear the difference between pitches? The same goes for being born deaf – if you can’t hear then you probably can’t sing (although I’ve read some information lately that would suggest that this is changing). Okay, so I don’t fall into any of those categories. Does that mean I can learn to sing? 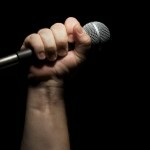 The definition of singing is the ability to make musical sounds with your voice. We can all speak and communicate with our voice, so singing is making a wider range of pitches and dynamics than our speaking voice. Most of the time when someone says they can’t sing, its more the case that they don’t know how to use their voice; their instrument. Imagine the first time you sat down at a piano having never taken lessons. You don’t really know what to do; you can press the keys but the chances of you being able to play your favourite song are slim. But it’s only because you don’t have the skills yet to play it. So you start taking piano lessons and after a few lessons you can play some basic scales and maybe some basic chords. Hey presto! You’re starting to learn how to play the piano, and building the required skills and coordination. Many people are the same with their voice, they don’t know how to make the vocal configuration for a pitch and so they can’t sing in tune. And they presume that they must be “tone deaf”. I’ve had at least a dozen singers walk in and tell me they are tone deaf and need help, and many more emailing me asking if they can learn to sing. My answer is always the same, unless one of the three points above apply – your vocal cords don’t work, you were born deaf or are truly tone deaf – then with some hard work you should be able to start making accurate pitches. Now that is very general, without hearing someone’s voice, its impossible to tell, but in most cases this is true. Well it’s a combination of things. Firstly, you need to learn how to make accurate pitch with those vocal cords. So its my job to figure out why you can’t make the pitch and then give you exercises to help you make the correct pitch. This can be a number of different exercises, depending on what the cause is. And once you have those exercises you need to practise, practise practise! Secondly, you need to train your “musical ear”. Once you start to be able to make pitch better, a trained ear tells you when you are flat or sharp. It will also help you know when you are in time with the music. That’s crucial for working on songs; if you can make the pitches correctly but have no idea if you are on the beat, off the beat, under the beat, or over the beat then what use will it be? So, we’ll spend time training your ear in lessons and then you need to go and do LOTS of listening to build your musical knowledge and experience. And not forgetting to practise what we’ve worked on. So far we’ve discovered for most people we can help them to make pitches accurately and then train their ear, but then there is always that last missing piece of the puzzle. That piece is musicianship, but what is musicianship? Musicianship is your experience and artistry as a singer. Everything you do and learn as a singer builds your musicianship. Do you think Beyonce just woke up one day and knew how to do amazing licks and trills? No, she had to work at it. She had to build up her musicianship and her musical knowledge of what notes work with what chords, and how to use licks and trills effectively in songs. Musicianship is something that can and can’t be taught, it comes with experience and practice. It can be the difference between a good singer and a great singer, and of course we all want to be great singers! Musicianship is also a huge kettle of fish and we are just scratching the surface here. But how do you build up your musicianship skills? Listen a LOT to different singers and different styles and genres; learn another instrument to help train your “musical ear”, learn some music theory, experiment with your voice and songs in different genres, and lots and lots of practice of all the above will all start to build musicianship. At this stage some people might start to feel a little frustrated. Don’t try and rush it, building your musicianship will take time and energy, but its well worth the effort as it can take you from being a good singer to a great singer. So, to answer the question ‘can anyone learn to sing?’, I am of the opinion that yes, most people can learn to sing. However, depending on the problem and how severe it is, it will take some time and effort on your part, but with the right teacher you can get there. What’s most important is never let it hold you back! If you love singing, then book in with a good teacher, work hard and you will reap the rewards of all your hard work! Let us know what you think, do you believe anyone can sing? Find us on Facebook, Twitter or Google+ and let us know your thoughts!